The Nigeria Police Force (NPF) has vowed to forcibly arrest Senate President, Bukola Saraki, if he fails to honour its invitation over his alleged complicity in the Offa bank robbery. The Police had invited Saraki for further questioning on the Offa bank robbery yesterday (Tuesday, July 24, 2018). But the Senate President ignored the invitation and went to the National Assembly despite theblocking of his convoy by security operatives at his Abuja residence. Force Public Relations Officer (FPRO), Jimoh Moshood, however, denied besieging Saraki’s residence as being alleged. 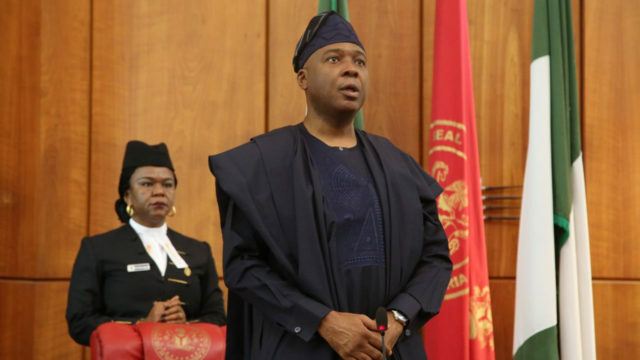 “The Nigeria Police Force on July 23, 2018 invited President of the Senate, Federal Republic of Nigeria, Bukola Saraki, to report to the head of investigation team at the Intelligence Response Team in Guzape junction, Asokoro Extension, Abuja on July 24, 2018 at 8am for further investigation. “This is in continuation of his indictment from confessional statements of five gang leaders arrested for their participation in the Offa bank robbery and gruesome murder of over 31 persons and snatching of 21 AK47 rifles on April 5, 2018. “But Saraki refused to honour Police invitation as at the time of this press release,” the statement further reads. Jimoh maintained that the police personnel pictured in the media were those in the Senate President’s convoy and others attached to him. “The Nigeria Police attention was also drawn to the innuendos in the early hours of yesterday that some policemen surrounded Saraki’s residence. “The Force wishes to state that it did not authorise deployment of police personnel to the residence of the Senate President or Ekwerenmadu as reported in the media. “However, the IGP has directed a thorough investigation of the matter to ascertain the facts because the police authorities will not allow justice to be perverted by this distraction. “The Nigeria Police will ensure that the rule of law prevails in this matter,” the statement added.